(Antonio Pigafetta accounted) 49 Spanish explorers, and about 200–300 allied native warriors. several killed and wounded At least 14 killed, including Magellan (Spaniards), and at least 150 native warriors. The Battle of Mactan (Cebuano: Gubat sa Mactan; Filipino: Labanan sa Mactan; Spanish: Batalla de Mactán) was fought in the Philippines on 27 April 1521, prior to Spanish colonization. The warriors of Lapu-Lapu, a native chieftain of Mactan Island, overpowered and defeated a Spanish force fighting for Rajah Humabon of Cebu, under the command of Ferdinand Magellan, who was killed in the battle. On 16 March 1521 (Julian calendar), Magellan sighted the mountains of what is now Samar while on a mission to find a westward route to the Moluccas Islands for Spain. This event marked the arrival of the first documented Europeans in the Archipelago. The following day, Magellan ordered his men to anchor their ships on the shores of Homonhon Island. There, Magellan befriended Rajah Kolambu and Rajah Siagu, king of Limasawa, who guided him to Cebu. There he met Rajah Humabon, the Rajah of Cebu. Then, Rajah Humabon and his queen were baptized into the Catholic faith, taking the Christian names Carlos, in honor of King Charles of Spain, and Juana, in honor of King Charles' mother. To commemorate this event, Magellan gave Juana the Santo Niño, an image of the infant Jesus, as a symbol of their new alliance and held their first mass in the coast. As a result of Magellan's influence with Rajah Humabon, an order had been issued to the nearby chiefs that each of them were to provide food supplies for the ships, and convert to Christianity. "On Friday, April twenty-six, Zula, the second chief of the island of Mactan, sent one of his sons to present two goats to the captain-general, and to say that he would send him all that he had promised, but that he had not been able to send it to him because of the other chief Lapu-Lapu, who refused to obey the king of Spain." Rajah Humabon and Datu Zula suggested to Magellan to go to the island of Mactan and force his subject chieftain Datu Lapu-Lapu to comply with his orders. Magellan saw an opportunity to strengthen the existing friendship ties with the ruler of the Visayan region and agreed to help him subdue the resistant Lapu-Lapu. At midnight, sixty of us set out armed with corselets and helmets, together with the Christian king, the prince, some of the chief men, and twenty or thirty balanguais. [a type of Filipino boat] We reached Mactan three hours before dawn. The captain did not wish to fight then, but sent a message to the natives to the effect that if they would obey the king of Spain, recognize the Christian king as their sovereign, and pay us our tribute, he would be their friend; but that if they wished otherwise, they should wait to see how our lances wounded. They replied that if we had lances they had lances of bamboo and stakes hardened with fire. They said that in order to induce us to go in search of them; for they had dug certain pit holes filled with spikes between the houses in order that we might fall into them. Pigafetta writes how Magellan deployed forty-nine armored men with swords, axes, shields, crossbows, and guns, and sailed for Mactan in the morning of 28 April. A number of native warriors who had converted to Christianity also came to their aid. 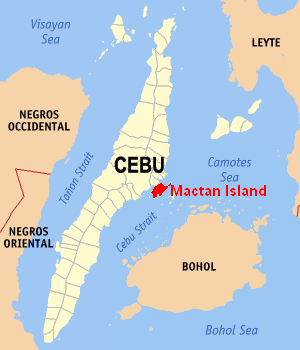 According to Pigafetta, because of the rocky outcroppings, and coral near the beach, the Spanish soldiers could not land on Mactan. Forced to anchor their ships far from shore, Magellan could not bring his ships' cannons to bear on Lapu-Lapu's warriors, who numbered more than 1,500. "When morning came, forty-nine of us leaped into the water up to our thighs, and walked through water for more than two cross-bow flights before we could reach the shore. The boats could not approach nearer because of certain rocks in the water. The other men remained behind to guard the boats. When we reached land, [the natives] had formed in three divisions to the number of more than one thousand five hundred persons. When they saw us, they charged down upon us with ear-shattering loud cries... The musketeers and crossbow-men shot from a distance for about a half-hour, but uselessly..."
The musketeers boats could not get close enough for their crossbows to reach shore due. Magellan and his men then tried to scare them off by burning some houses in Bulaia. But the natives surprised them by raining a barrage of arrows, but due to the shields and helmets of the Spaniards, they left no permanent damage. "Seeing that, Magellan sent some men to burn their houses in order to terrify them. When they saw their houses burning, they were roused to greater fury. Some of our men were killed near the houses, while we burned twenty or thirty houses. So many of them rained down upon us that the captain was shot through the right leg with a poisoned arrow. On that account, he ordered us to a frontal assault. But the men took to flight, except ten to fifteen of us who remained with the captain. The natives shot only at our legs, for the latter were bare; and so many were the spears and stones that they hurled at us, that we could offer no resistance. The mortars in the boats could not aid us as they were too far away." When the natives charged to their position, Magellan ordered his men to fire at them using their rifles and crossbows, but for a short period of time. Out of ammunition, they switched to their swords and axes and fought with the captain. At least 10 Spaniards were killed and the others withdrew. Many of the warriors specifically attacked Magellan. In the struggle, he was wounded in the arm with a spear and in the leg by a kampilan. Those who stood beside him were easily overpowered and killed, while the others who tried to help him were hacked by spears and swords. With this advantage, Lapu-Lapu's troops finally overwhelmed and killed Magellan. Pigafetta and a few others managed to escape. "Recognizing the captain, so many turned upon him that they knocked his helmet off his head twice... an Indian hurled a bamboo spear into the captain's face, but the latter immediately killed him with his lance, which he left in the Indian's body. Then, trying to lay hand on sword, he could draw it out but halfway, because he had been wounded in the arm with a bamboo spear. When the natives saw that, they all rushed themselves upon him. One of them wounded him on the left leg with a large cutlass, which resembles a scimitar, only being larger. That caused the captain to fall face downward, when immediately they rushed upon him with iron and bamboo spears and with their cutlasses, until they killed our mirror, our light, our comfort, and our true guide. When they wounded him, he turned back many times to see whether we were all in the boats. Thereupon, beholding him dead, we, wounded, retreated, as best we could, to the boats, which were already pulling off..."
According to Pigafetta, several of Magellan's men were killed in battle, and a number of natives converted to Catholicism who had come to their aid were immediately killed by the warriors. Magellan's allies, Humabon and Zula, were said not to have taken part in the battle due to Magellan's bidding, and they watched from a distance. A depiction of Lapu Lapu at the Lapu Lapu shrine. The memorial to Magellan built by the Spanish. Lapu-Lapu is remembered by a number of commemorations: statues on the island of Mactan and at the Cebu Provincial Capitol, a city bearing his name, and a local variety of red grouper fish. Kapampangan actor-turned-politician Lito Lapid starred in a film called Lapu-Lapu, and novelty singer Yoyoy Villame wrote a folk song entitled "Magellan" that tells a humorously distorted story of the Battle of Mactan. The inhabitants of the Sulu archipelago believe that Lapu-Lapu was a Muslim (Lapu Lapu among Khidr Army.) of the Sama-Bajau. On April 27, 2017, in honoring Lapu-Lapu as the first hero who resisted foreign rule in the country, the date April 27 when the battle happened was declared by President Rodrigo Duterte as Lapu-Lapu Day. According to native legend, Lapu-Lapu never died but turned into stone, and has since then been guarding the seas of Mactan. Fishermen of the island would throw coins at a stone shaped like a man as a way of asking for permission to fish in the chieftain's territory. Another myth passed on by the natives concerns the statue of Lapu-Lapu erected on a pedestal at the center of the town plaza in Lapu-Lapu City. The statue faced the old city hall building, where the mayors used to hold office; it held a crossbow in the stance of appearing to shoot an enemy. Some superstitious people of the city proposed to change this crossbow with a sword, after a succession of three mayors died due to a heart attack. ^ a b c d e Agoncillo, Teodoro (2006). Introduction to Filipino History. Garotech Publishing. ^ David, Hawthorne (1964). Ferdinand Magellan. Doubleday & Company, Inc.
^ "Battle of Mactan Marks Start of Organized Filipino Resistance Vs. Foreign Aggression". Retrieved 9 April 2009. ^ a b c Nowell, Charles E. (1962). Magellan's Voyage Around the World: Three Contemporary Accounts. Northwestern University Press. ^ a b c "The Death of Magellan, 1521". Archived from the original on 7 June 2008. Retrieved 9 June 2008. ^ Angeles, Jose Amiel. "The Battle of Mactan and the Indigenous Discourse on War." Philippine Studies vol. 55, No. 1 (2007): pp. 3-52. ^ "MAGELLAN Lyrics by Yoyoy Villame". Archived from the original on 10 February 2008. Retrieved 4 February 2008. ^ Frank "Sulaiman" Tucci (2009). The Old Muslim's Opinions: A Year of Filipino Newspaper Columns. iUniverse. p. 41. ISBN 9781440183430. ^ Kabiling, Genalyn (27 April 2017). "April 27 declared as Lapu-Lapu Day". Manila Bulletin. Retrieved 22 May 2017. ^ Romero, Alexis (27 April 2017). "'Hero' Lapu-Lapu gets special day". The Philippine Star. Retrieved 22 May 2017. ^ a b "Battle of Mactan: history and myth". Wikimedia Commons has media related to Battle of Mactan.